The Grapes of Wrath begins with (the son) Tom Joad leaving the Oklahoma state prison in Macalester and heading back to his home located near Sallisaw, Oklahoma. Along the way, he encounters “The Preacher,” with whom he talks about the community which he left years ago after killing a man. In the process, readers learn the back story about the Joad family. Steinbeck takes the reader into the heart of the Dust Bowl experience as Tom Joad walks from the highway down the dirt road to where he finds his family in the process of loading their truck to head to California. This is a classic story of homecoming. Unlike Tom Joad, however, members of the extended Cartwright family are not in a position to go back home. There is no “place” that we can go that our family has retained. (Indeed, I am not sure that the family owned land in Scott County for very long in the 20th century before Thomas Cartwright’s children began to rent property as tenant farmers.) And truth be told, we are not the first generation of Cartwrights to find ourselves in that position. My Aunt Dorothy does not recall ever going to Shiloh, and I think it is possible that none of her siblings did either. 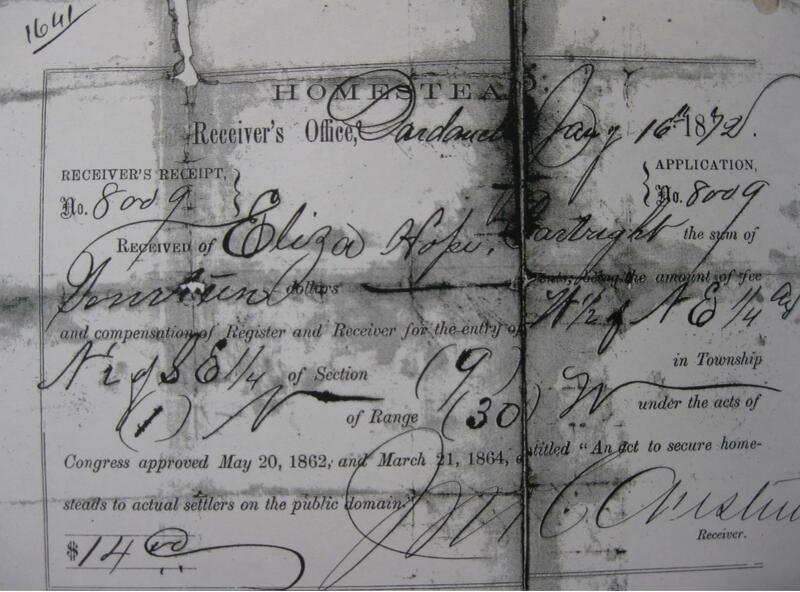 We have documents like Eliza Cartwright’s homestead application that prove that once upon a time our ancestors did live in the vicinity of Shiloh Church (see image below), but these are the bare bones of history. We don’t actually own the land of the geographical landscape — unless someone would want to claim “ownership” of the graves in the graveyard. I have to wonder if John Steinbeck had read John Smith’s travel narrative about his first two trips to the American colony he helped found at Jamestown. “As History without Geography wanders like a vagrant without certain habitation, so Geography without History is like a carcasse without motion.” The scene at the end of the movie where passage about “the ghost of Tom Joad” is depicted also appears to be haunted by the loss of the connection between geography and history. Smith’s journey may not disclose all of the archetypal patterns associated with the longing for home, but there can be no doubt that Steinbeck has in mind the same metaphorical pairing that John Smith employed in the late 16th century. In The Grapes of Wrath, the character “Muley Graves” is the former neighbor, who like the Joads has lost his home. Each night he wanders around the countryside visiting the places where his neighbors once lived. Muley cannot bring himself to leave, even though the rest of his family has. This entry was posted in Prologue: Going Up to Shiloh. Bookmark the permalink.